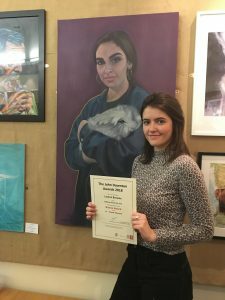 The John Downton Award for Young Artists is an annual exhibition which encourages and celebrates the creativity of Kent’s young artists. It is open to students aged 11 to 18 from schools and colleges across Kent. We are very pleased to announce that on Thursday 15th November Lauren Browne (Year 13) was awarded the Bronze Award in the 17 to 19 Years category at these awards.